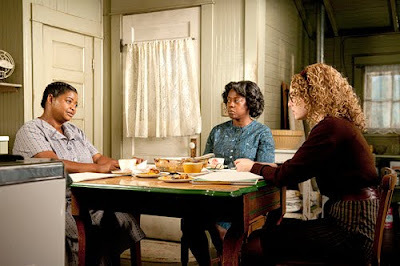 Reel Talk Online: DVD Review: "The Help"
"Love and hate are two horns on the same goat. And you need a goat." With all the beautifully nuanced stories of the black experience in cinema, too often Hollywood fails to show the experience unless it is told by a white character, in which case the actual black experience tends to be watered down and stereotypical to elevate a white story. Much like 2009's The Blind Side, The Help does just that. 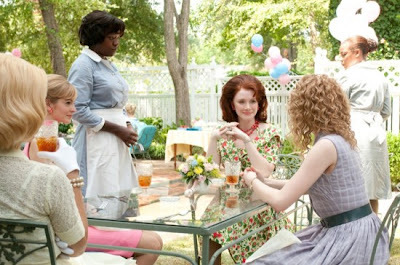 Based on the bestselling novel, The Help tells the story of Skeeter (Emma Stone), an aspiring writer. While suffering through another mundane conversation between her racist, narrow-minded friends Hilly, Elizabeth, and Jolene (Bryce Dallas Howard, Ahna O'Reilly, and Anna Camp), she arrives at an epiphany that she would write a book from the perspective of the help, otherwise known as the maid (Viola Davis). The mere thought of Skeeter giving a voice to the help works the uptight Hilly (Howard) into a tizzy and she tries her best to intervene. So Skeeter and Aibileen (Davis) create an underground meeting, of sorts, where they can freely discuss what Aibileen really thinks about her employer and being a maid. As she becomes more comfortable, Aibileen invites other maids in town, including Minny (Octavia Spencer), to divulge their own stories of abuse, heartache, and the scandalous lifestyles of their white employers. Thus, they create a little haven of truth. The movie seems to rest on the idea that what the maids reveal about their employers (from their lack of parenting skills, to their mistreatment of them) is somehow surprising. What rock is Skeeter sleeping under that she is baffled by the stories the maids tell her? Downtrodden stories of civil injustice, wrongful accusations by their bosses, and other unjustified cruelty. Hello, this is the 1960s. Does she not own a radio, or listen to the news? Skeeter was supposed to be an Ivy League grad; she can't be this oblivious. So, in addition to learning all the woeful stories of the common help, we have to endure Minny's prolonged lesson in frying chicken (which, in the movie, is apparently some kind of spiritual process) with her naive employer, Celia (Jessica Chastain). We're also forced to stomach the repetitious pep talk bestowed in broken English by Aibileen to the daughter of her white employer, Hilly: "You is smart, you is important..." It is annoying the first time, but becomes cringe-worthy by the tenth time. If we're going to glorify a story set during the civil rights movement (with little mention of said movement), let's glorify both sides of the story. It would have taken a far less offensive and less clichéd turn if the Aibileen pursued Skeeter about sharing a story, and if she already had established a secret society with the other maids. The fact that Skeeter approached her gave her an upper hand in the story, therefore giving the impression that she was some kind of savior for Aibileen and the other maids. That, if not for her, they would have no voice. Keeping the roles as they were only glorified the white half of the story, and kept the black half less glorified and in its place. The acting in the movie was solid, although not extraordinary and at all award-worthy. Sissy Spacek, who plays Hilly's mom, was terribly underused, as was Allison Janney, who plays Skeeter's mom. Cicely Tyson also makes a brief appearance in the movie, to further highlight the injustices brought to the help. Stone is again miscast (as she is in Crazy, Stupid, Love) in the role of Skeeter. Her acting was fine, but the actual age difference between her and Chastain didn't lend itself to convince audiences that the two grew up together in the movie. A more seasoned, and less bushy-tailed actress would have been more suitable for such a role. Her youth also made Davis and Spencer seemed that much older and, frankly, more dependent that they were relying on her to give them their sense of freedom, so to speak. Davis and Spencer, two wonderful accomplished actresses, shine most when they're sharing scenes with each other, but unfortunately can't offer more than the script allows them. They are the title characters, but yet their stories are so glossed over that we feel nothing for them, which makes them uninteresting. Chastain and Howard are perhaps the most entertaining characters, though they're also detestable in even their funnier moments. But aside from its substantial performances, The Help's completely uninteresting script caused the whole movie to be dead on arrival. "completely uninteresting script" - Yeah, right. This film is definitely overrated. Hollywood did not hesitate to adapt this book to the screen and go into production. It's definitely a white savior story. Your views on Skeeter's obliviousness to the struggles of the maids at the time make sense. I never thought of it that way. Overall, I wasn't impressed with the film either. Appalling, entertaining, touching and perhaps even a bit healing, The Help is an old-fashioned grand yarn of a film, the sort we rarely get these days. Good review Candice. Very intereseting review, I think I've approached films that are supposeed to tell an ethnic story but don't do it the way they think they do. Just watched it for a third time. My boyfriend just watched it for the first time. He's a tough guy but cried like a baby when "Abi" walks down the street. This is a timeless and beautiful film with breathtaking performances from all the actors. As a southerner who can trace ancestors back to the Civil War, it rings as true as the gospel we red staters love. True on so many levels. Pure, beautiful feminism. We need to make MORE films like this in Hollywood. Must see THE HELP!